I created this mood board a couple months ago and had the opportunity to pop by this glamour space this week to see how it's all rolling along. I LOVE it! My girlfriend has great style and likes a bit of glam and sparkle in her life. It's been so fun working on this space together and she's been open to trying out new things. I'm looking forward to having our first cocktail in her new pad next week. 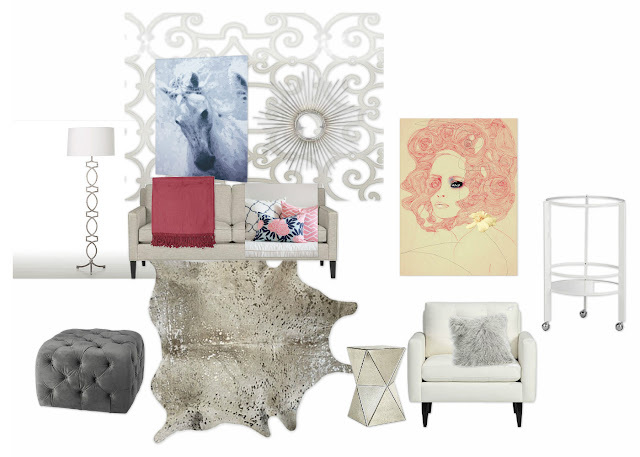 Items have changed since this mood board but here is the original vision. After looking around my very messy (and not so glamorous) house this morning I kinda want to move in! Enjoy!